University students in Iowa recently prevailed in a federal free speech lawsuit that affirms students’ rights, no matter what their political persuasion. The U.S. Court of Appeals for the Eighth Circuit ruled that two school administrators employed by Iowa State University violated the rights of two students who served as top administrators of the school’s local chapter of NORML (National Organization for the Reform of Marijuana Laws). The two students had plans in the works to print off a series of t-shirts that showed a marijuana leaf alongside the school’s mascot. School officials claimed that the production of such material would be a violation of the university’s trademark policy. Students sued the school in federal court, arguing that the policy on the mascot trademark was a violation of students’ free speech rights. Last year, the judge issued a ruling agreeing with the students and prohibiting the school from stopping the students from making the shirts. The judge ruled that the school’s rejection of the t-shirts with NORML’s designs were discrimination because the decision was based on the fact that administrators disagreed with the students’ political point-of-view. On appeal, the school argued (among other things) that the U.S. Constitution and previous rulings by the U.S. Supreme Court gave the school the sole right of discretion in deciding how its trademark could be used. However, the federal appellate panel disagreed. The court held that the student organization’s use of a marijuana leaf on the shirts isn’t a violation of the school’s trademark because the organization is advocating for reformation of cannabis laws, not promoting the illegal use of cannabis. One of the students commented to a reporter on her pleasure with the ruling, and in particular that the three-judge panel sided with plaintiffs unanimously. The students’ complaint explained how the school censored the t-shirts made by the group solely on the basis of the imagery and messaging that involved marijuana. The school also removed the chapter’s staff adviser and then initiated a number of new rules for using the school’s trademark solely for the purpose of restricting the campus organization’s free speech rights. Prior to filing the lawsuit, the students had said they were disappointed with the school’s decision, but it wasn’t until the school forbid them even from printing the name of their organization on t-shirts due to the fact that the “M” stood for marijuana that they were motivated to sue. Now that the Eighth Circuit has decided the matter, the next step, if any, would be for the school to ask the U.S. Supreme Court for review on appeal. 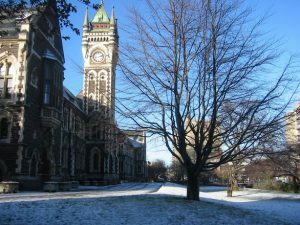 A school administrator said university lawyers are reviewing the ruling and no decision has been made at this point about whether to appeal the case to the next level. Currently, marijuana is not legal in Iowa, even for medicinal purposes, putting it in a minority of states. A recent pole by the Des Moines Register revealed that 80 percent of adults in that state do want marijuana legalized for medicinal purposes. However, less than 40 percent would like to see it legalized for recreation.